I am sure this question has a multitude of answers. Some of you would say for “FUN”. Some of you would say for the “COMPETITION”. Some of you would say for the “EXERCISE”. All of these are fantastic and very valid reasons to play golf. This changes things now doesn’t it? Some of you might say “to not lose any golf balls”. Some of you might say “to not have any 3 putts”. There are many goals when it comes to golf and being successful at it. Invariably the main GOAL of playing a round of golf is shooting PAR for the course (or better). There are golfers who play golf their ENTIRE life and fail to achieve this goal. But what if I could plant a seed in your Golf Brain that would completely change how you should approach playing golf to shoot par? Play golf from a distance that gives you the BEST chance of shooting par and that gives you the greatest chance to hit clubs into greens like those on the LPGA and PGA Tours. Just pause and think about it for a second…. Junior tours have Juniors play from yardages that give them the greatest chance to make a par or birdie. As they get older and better at the game they move back to play tees that again are suitable for how far they hit the ball. (It doesn’t make sense for a 7 yr old to play from the yellow tees, take 5 – 6 shots to get it on the green and then a possible 2 – 3 more strokes, shooting 7-9 each hole does it? They’d be exhausted!!!) Do you find it takes you too many shots and cannot hit greens in regulation because you are playing from tees that don’t allow you to? Are you EXHAUSTED after playing golf? US Kids Golf Foundation have recently implemented a unique and inventive way for players to have the most enjoyable, fast and potentially lowest scoring round for their players & members at Long Leaf Golf & Family Club, in Pinehurst NC. 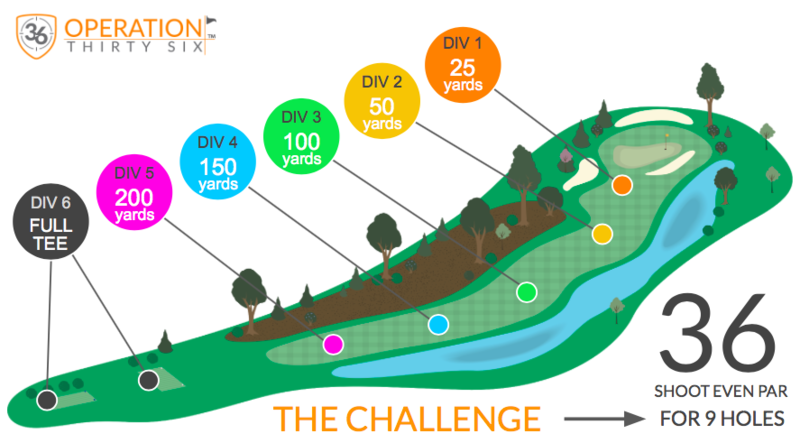 On their range when warming up players are asked to find out how far their drives fly according to this coloured chart. 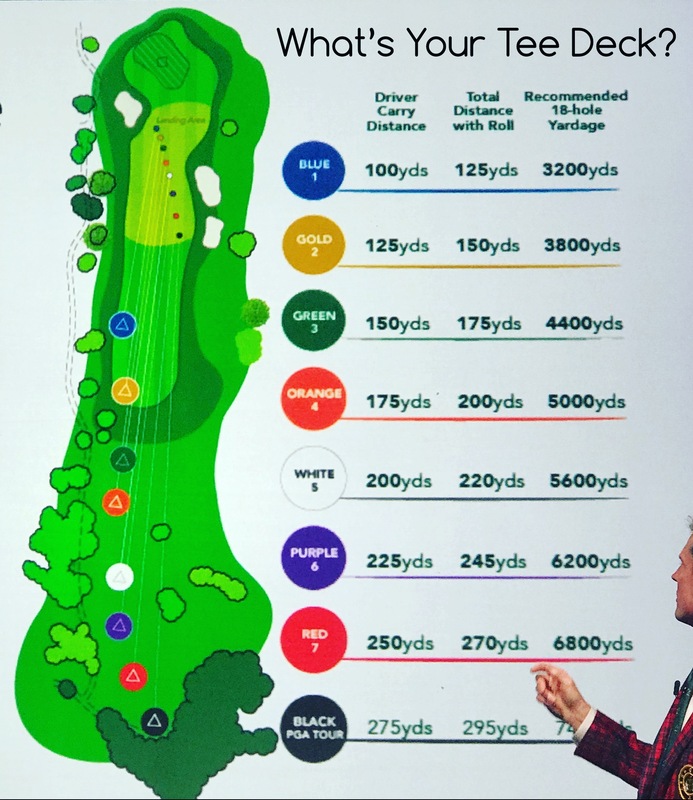 From there the club recommends what colour tees they should play based on how far they carry the ball in the air with their driver. (Where would you fall in according to THIS chart?) The results have been nothing short of amazing. Members have reported lowering their handicaps by nearly 4 strokes on average, playing times have been reduced by almost 15 minutes per foursome, and the overall enjoyment and feedback has been nothing but positive. But could you move up to 5000 yards from 6000 yards? Would you move from 5000 to 4000? Would our egos allow it? I would love to conduct an experiment, similar to our Junior Golf Programming by Operation 36, where you start 25 yards (Yes 25 yards) from the green and play 9 holes of golf. What do you think you would shoot? Par? Under Par? In Operation 36 juniors must reach this level of accomplishment before moving back to 50 yards and trying again. If they can continue to succeed in their ability to shoot par for 9 holes (that would be a great thing wouldn’t it) they continue to move back until they reach the appropriate tees for their ability. This allows for confidence to build, enjoyment to grow and skill to be enhanced through a program that is measurable and trackable for each golfer. Don’t those words sound like words you would like to have to describe your golf game? Could you do it? Could you start the year from a yardage that would give you the best chance at shooting par and if accomplished then and only then move back to the next set of tees? Everyone wants to play faster. Everyone wants to shoot lower scores. Golf is HARD. Golf is supposed to be enjoyable, not frustrating. Make Golf FUN Again…..at least for yourself and see what happens. I mean, what’s the worst you could do? Shoot Par?